Natural Decadal Climate Variability: Societal Impacts is an important work for understanding the natural decadal climate variability (DCV), a phenomenon which has made long lasting impacts on civilizations, especially on water availability and agriculture. 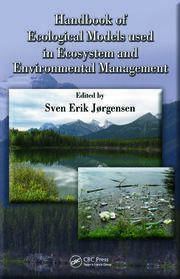 This book comprehensively covers multiyear to decadal variations in instrument measured precipitation and temperature, water availability and river flows, crop production, agricultural irrigation, inland water-borne transportation, hydroelectricity generation, and fish and crustacean captures since the 1960s. A longer term perspective is provided with the use of multi-century data on dry and wet epochs based on tree ring information, and corroborating evidence from other literature. This valuable work will benefit climate scientists, meteorologists, hydrologists, agronomists, water transportation planners, resource economists, policymakers, professors, and graduate students and anyone else who has an interest in learning how natural climate phenomena has influenced societies for at least the past 1000 years. Dr. Vikram Mehta earned his M.Sc. in Physics in 1977 and post-graduate diploma in space sciences and their applications in 1979 from Gujarat University, Ahmedabad, India. He then became an Indian Space Research Organization (ISRO) Research Fellow at the Space Applications Centre, ISRO, Ahmedabad, India from 1979 to 1982, working on microwave remote sensing. He studied upper atmospheric physics at the University of Saskatchewan in Saskatoon, Canada, from 1982 to 1984, earning a post-graduate diploma in physics. A strong interest in more application-oriented scientific research led him to the Department of Meteorology at the Florida State University in Tallahassee, Florida, where he earned his M.S. in 1986 and Ph.D. in meteorology in 1990. After his Ph.D. work on natural decadal climate variability (DCV), Vikram was a research scientist from 1990 to 2002 at the National Aeronautics and Space Administration (NASA)–Goddard Space Flight Center and the University of Maryland–College Park, conducting further research on DCV. Strongly motivated to use climate science for societal benefits, Vikram founded the Center for Research on the Changing Earth System (CRCES), a nonprofit, scientific research organization in Columbia, Maryland, in 2002. Currently, he is the President and Executive Director of CRCES, which specializes in research on DCV and its impacts on water, food, energy, and water-borne transportation. Vikram also served as the Executive Director of the Indian Centre for Climate and Societal Impacts Research (ICCSIR) in Ahmedabad, India, from 2008 to 2013. At ICCSIR, Vikram established research programs in climate science, and applications of climate information for management of water resources and agriculture; and programs to educate and train college and university teachers and students in climate science. Vikram’s major research interests include understanding and prediction of DCV; assessment and prediction of DCV impacts on regional and global water– food–energy–public health securities; and climate and public policy. Vikram has published more than 150 research papers and conference/workshop contributions. For outstanding achievements in climate science, the Non-Resident Indian Welfare Society of India bestowed on Vikram the Mahatma Gandhi Samman (Honor) in 2012 in a ceremony in the House of Lords of the U.K. Parliament in London; and their highest award, the Hind Ratna (Jewel of India), in 2015 in New Delhi, India. 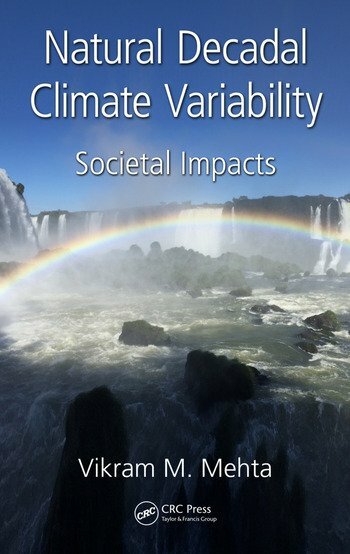 "This is an exceptionally well thought out book on a vitally important, but largely overlooked aspect of climate change science on the near term implications of decadal climate variability (DCV). Not only does Dr. Mehta fill an absolutely critical void in climate science documentation by comprehensively inventorying and describing multi-year to decadal variations in precipitation and temperature, he goes a step further by doing a masterful job of sorting through the chaotic accumulation of previous climate variability research to clearly describe how the impacts of DCV’s affect water security and the stability of civil societies across the mega-nexus of water availability, agricultural production, energy, water transportation, and the sustainability of natural resources." "This is an informative book on multiyear to decadal scale climatic variations and their impacts on precipitation, water availability, crop production, water transportation, fish catch, economy and society. 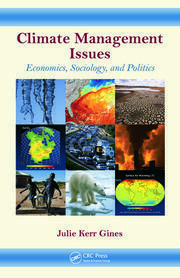 The author has provided a good overview and discussion on the phenomenon of natural decadal scale climate variability and its hydrological impacts over different regions of the globe, which would be of interest to meteorologists, hydrologists, agriculture scientists, climate and application scientists, graduate students, social scientists and policymakers." 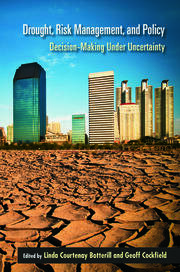 "This book admirably fills a yawning gap in the climate literature. There has been almost nothing before on the essential topic of decadal climate variations and their impact on society. Amidst the justifiable concern with Global Warming it is a welcome reminder that the climate changes that have impacted people in the past and continue to impact people in the present are due to natural variations. The extremes of the future will be a combination of natural and man-made impacts. Without skimping on the climate science, Vikram Mehta has provided a model presentation of the impacts of climate on all the things people most care about."